Migration is within us – will we choose life or death? Posted on September 23, 2015 September 23, 2015 by Marlene Hoenig - You are one of God's Treasures! I don’t know about you but whenever I get stressed and don’t know what to do… I feel a migration movement coming on. What I mean is I want to get up from where I am at and move to another place. You’ve heard the grass is greener on the other side? I’ve often wondered if this is attached to migration. In the case of passing from this life to the next. I do believe the grass is definitely greener on the other side, at least for me. The great annual migration of millions of zebra, wildebeest (gnu) and other antelope in East Africa tops almost every list of safari experiences. When you plan your trip, you’ll need information about the annual migration, the best times to witness this wildlife spectacle, where to stay, and when to see it in Kenya and Tanzania. Each year around 1.5 million wildebeest and 300,000 zebra (along with other antelope) gather up their young and start their long trek from Tanzania’s Serengeti Plains, further north to Kenya’s Masai Mara National Reserve. They go in search of food and water. Their journey runs in a clockwise circle and the animals cover a distance of around 1800 miles. It’s a tough journey, and every year an estimated 250,000 wildebeest don’t make it. 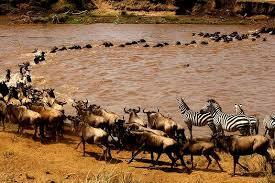 One of the most spectacular sights of the migration is when the herds gather to cross the Grumeti River (Tanzania) and the Mara River (Kenya) from July through September. Psalm 23 reminds me of this distinct urge and how David must have felt when he was tending his flock and they had this sudden urge to migrate! When are we comfortable with passing from one dimension into the other. In David’s case he was hunted, betrayed, and pursued by his enemies in an attempt to keep him from his inheritance. This was a position and place to which he had not yet arrived, yet I believe deep within him the urge to continue through trauma, stress and trials moved him to not give up and to pursue the unknown. I wonder if he was choosing life here, and wanting what only death could bring… a migration to the other side where rest, peace and eternity reigns supreme. 37 For that day that thou goest out, and passest over the river of Kidron, know assuredly, that thou shalt die the death: thy blood shall be upon thine own head. 15 Then went I up in the night by the brook, and viewed the wall, and turned back, and coming back, I entered by the gate of the valley, and returned. 40 And the whole valley of the dead bodies, and of the ashes, and all the fields unto the brook of Kidron, and unto the corner of the horsegate toward the East, shall be holy unto the Lord, neither shall it be plucked up nor destroyed anymore forever. It is interesting to study about this brook and valley and the filled and unfulfilled prophecies. You can read about the first and last time this brook and valley are mentioned Click here. The darkest valley is spoken about in scripture. Before you come to it you must go over the brook of Kidron. David walked over it, Nehemiah, Jeremiah….then finally Jesus and his disciples on the way to the garden of Gethsemane on the night he was betrayed. The famous song says, “we all have to walk that lonesome valley by ourselves.” Migration comes to us all to make that walk from this life to the next. I have chosen to walk in the way of Jesus. He went before me, but He is still with me. Previous Post I Have an Inheritance!